Lots to tell you about so far this year, with so little time to tell it you in! I’ve had a good old session with my friends at Hammond UK and have a review of the XK5 in the pipeline, I continue to gig with my band The Quik Beats and continue to record with musicians from all over the world (and Nottingham!). My 1960 C3 did a gig without me last month (!) and I am working hard to get it fully road-worthy for our theatre gig in the Midlands next month. Had a good chat with David Stone from Rainbow over the Christmas break, oh and I am contributing to a really exciting written project as we speak, which will be come apparent at a later point. 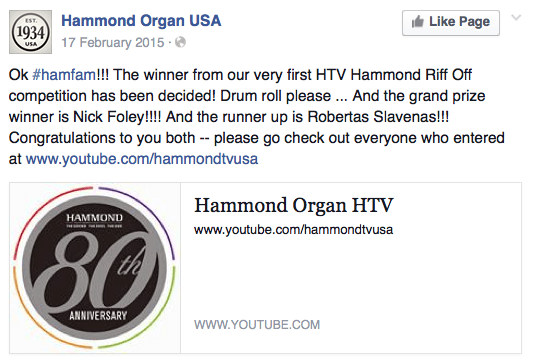 It’s also three years to the week since I won the Hammond USA Riff-Off championship too!